Take a trip back to the '90s with this curious, rather literally named little oddity for PC. I love '90s shooters -- I love them way more than modern shooters, in fact. As such, it was with some interest that I booted up Hippomancer's Rogue Shooter: The FPS Roguelike. I wasn't disappointed. Rogue Shooter was clearly made by people who know and love '90s shooters and wanted nothing more than to make a '90s shooter. Not a '90s-style shooter; a '90s shooter. As in, with all the limitations we had to deal with in that era. Maze-like levels with walls that are all the same height. A complete lack of a vertical axis. The inability to look up and down -- though without a vertical axis, why would you need to? -- and sprite-based enemies, objects and obstacles. Oh, and dreadful, dreadful MIDI music. The fact that some of the weapons are a callback to Blood's "Guns Akimbo" mode is pleasing. The garish audio-visual spectacle of the game -- which can't be anything but deliberately horrendous -- will be enough to send some modern gamers running and screaming almost immediately and that's absolutely fine; this title is clearly intended for gamers "of a certain age" such as myself. But it's more than just a nostalgia trip; by combining the frenetic pace of the typical '90s shooter with elements of the presently fashionable roguelike genre -- procedural generation, permadeath and RPG-style progression -- Rogue Shooter ends up being a title with a surprising amount of depth to it once the allure (or repulsion) of the DayGlo visuals and Casio keyboard demo-button music wears off. The game's premise is authentically flimsy -- a space station has been overrun with aliens and you must charge in there, kill all of them (or at least most of them) and make it to the 100th level. Along the way you'll gather weapons and items that will help you out, though in one of the game's few breaks with '90s shooter conventions, you're limited in how much you can carry at once -- two weapons, a few pieces of armor, three usable items and a few miscellaneous gizmos. 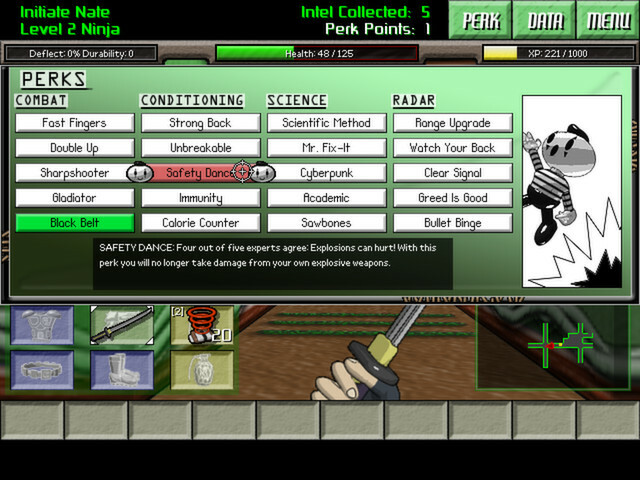 There's a System Shock-style weapon degradation system, so you'll need to make use of workbenches and collectible tools to maintain your weapons -- or simply find new ones -- and an authentically roguelike "hunger" system whereby your performance will suffer if you don't have enough rations to consume at the start of a level. You can also collect and combine "science" items to make useful consumables, and hack into tablets with a stupidly difficult minigame to earn more credits. Those RPG elements in action. You'll unlock more perks as you gather intel. There are two progression systems in the game: a temporary one during a single play session, whereby your character levels up and unlocks perks as you kill enemies and earn experience; and a persistent one, somewhat akin to that seen in Rogue Legacy, that unlocks new game content as you collect "Intel" items on your various characters' doomed expeditions into Helios Station. Over time, you'll unlock a variety of material: humorous log entries that depict the largely pointless but amusingly written story of Helios Station; information and weak point data on enemies; permanent upgrades for future characters; and new starting classes that determine the equipment and items you start with when you begin a new game. In other words, the game is far more than a one-shot (no pun intended) joke at the expense of -- or possibly in homage to -- '90s shooters. It's a game that rewards patience and repeated play with new and interesting things to fiddle around with, and the different character classes in particular make for markedly different experiences, at least in the early game. Beginning a new expedition as a well-equipped soldier is very different from starting out as a prisoner with only a pair of boots and three syringes of stimulants to their name, for example. Trying out new characters as you unlock them is a lot of fun. It's not all roses, though. 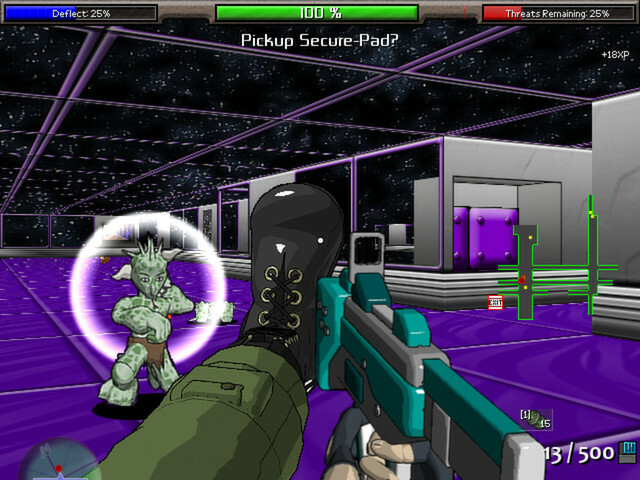 The high-speed nature of the game can sometimes lead to a feeling of the controls being somewhat slippery, particularly when fighting around corners. Ammo and weapons can be scarce -- fine in a more cerebral roguelike; less so in an action-packed title like this. Sound is inconsistent; the rumbling bass of the elevator between levels nearly blew my speakers up, but the guns all sound rather weedy. And, as previously mentioned, the music is just awful. Run out of ammo and you'll have to resort to a Duke Nukem-style quick kick to the face. Plus there's the elephant in the room: procedurally generated levels just aren't very interesting. It's cool that the game is different every time you play in theory, but when all that boils down to is a slightly different arrangement of identical-looking corridors, things just start to feel very monotonous indeed. And herein lies one fundamental misunderstanding of '90s shooters on Hippomancer's part: they weren't just about charging around at 90 miles per hour spraying bullets everywhere and hoping a few hit. No; interesting level design played a huge part in what made Rogue Shooter's obvious inspirations Wolfenstein 3-D and Blake Stone: Aliens of Gold great. It was a combination of numerous elements: careful use of textures to aid navigation (Wolfenstein didn't even have a map function! ); themed areas to stir the imagination and make even the abstract design of the levels feel somehow believable; careful enemy placement to provide a well-paced challenge. 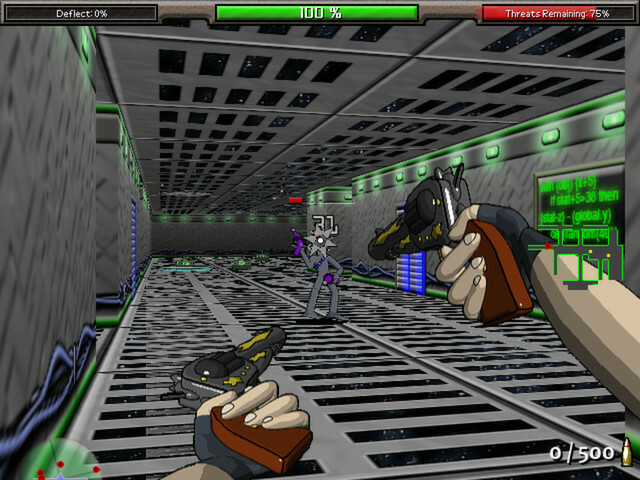 Rogue Shooter fails on all these counts; each level has just a few very similar wall textures (though you do have an automap); the name given to each area seems to bear very little relation to what you'll find there, making the theme largely irrelevant; and enemies are scattered around the map completely at random, meaning you often start a level completely surrounded. The game does at least offer you a grace period before the level starts -- you have to press the "use" key to start everything moving, so you can survey your surroundings before the carnage begins -- but it can sometimes feel a little unfair to be dogpiled by powerful foes the moment the level starts. Despite all this, though, Rogue Shooter is fun, and there's enough meat on the bones to make it more than a novelty purchase to be played once and then forgotten. It has its heart in the right place and, for the most part, does a good job of channelling the "feel" of '90s shooters; it just lacks a certain degree of polish and finesse to make it into a truly essential purchase. Visuals: "Ugly" doesn't even begin to describe it, but those who grew up in a time when all games looked like this might enjoy the nostalgia trip. Music and Sound: The music is made up of short, dreadful MIDI-style monstrosities, while the weapon effects lack "oomph." The elevator sound between levels, however, will have your neighbors banging on your walls very quickly. Interface: The game is simple to control, occasional slipperiness aside, and the RPG elements are well implemented without being intrusive. Lasting Appeal: Making it through a hundred floors is a challenge, but amid your failed attempts you'll unlock new content and expand the game's scope. Whether you'll stick with it in the long term is another matter, but there's certainly a lot of content here. An interesting attempt to channel the feeling of '90s shooters that is successful in some ways but lacking in others. Fun for a while, but then the flaws start to show. Stick with it and there's a surprising amount of depth to discover. Tagged with hippomancer,	Reviews,	rogueshooter.